An outbreak of methanol poisoning is blamed for more than 100 deaths in northern India. Here, a man is admitted to Saharanpur Civil Hospital after getting sick from toxic locally made alcohol in Uttar Pradesh. 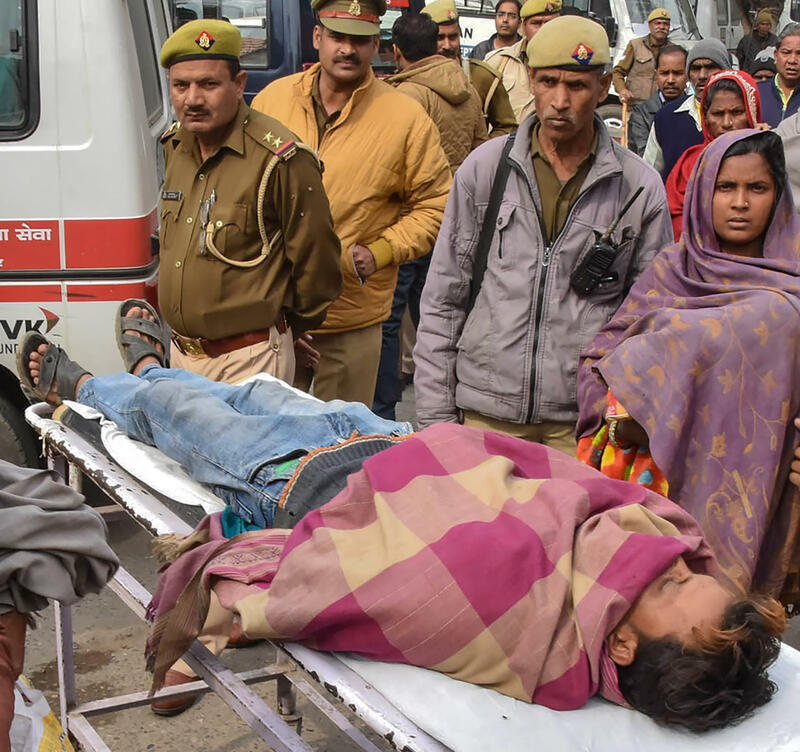 Bootleg liquor is being blamed for more than 100 deaths in northern India, after alcohol poisoning sickened people in two states. It's the worst outbreak of deadly booze to hit India in years. Dozens of deaths have been reported in both Uttarakhand and Uttar Pradesh — two neighboring states that are east of New Delhi. "Victims complained of stomach pains and respiratory problems," NPR's Lauren Frayer reports from Mumbai for our Newscast unit. "Autopsies show traces of methanol, a chemical that attacks the nervous system. Illegally made liquor is widespread in India, where many can't afford brand-name alcoholic drinks." Police have arrested four suspects linked to the deadly batches of illegal liquor, according to Reuters, citing senior superintendent of police Janmaijai Prabhakar in Haridwar, Uttarakhand. The deaths from the homemade booze, known to many Indians as "hooch" or country liquor, have sparked protests, accusations and finger-pointing. Police in Uttar Pradesh say a man named Pintu — who died along with five relatives after drinking the tainted booze Friday — may have brought containers of the liquor from Uttarakhand, according to India Today. But the man's family denies that account, saying he was a known bootlegger. They allege that the police had taken a cut of his profits in the past. Over the weekend, the regional government announced compensation payments to victims and their families; on Monday, protesters blocked roads and held a demonstration to demand more help. "Our children should get free-of-cost education," they said, according to news outlet ANI. "Women who lost their husbands should be given jobs. Culprits should be given strict punishment." Many of the deaths were reported in the past four days, triggering a broader crackdown on illegal liquor. Authorities in Uttar Pradesh have arrested about 3,000 people and seized nearly 80,000 liters of hooch, Indian Express reports. The newspaper adds that the illegal booze is commonly seen during wedding season — which the Express says is at its height in the region. Methanol is a toxic alcohol that's also known as wood alcohol. It's used in a number of commercial products, from antifreeze and windshield washing fluid to fuels and paint thinner. "The estimated minimum lethal dose for adults is approximately 15-30 ml [0.5 ounces-1 ounce]," according to Renal and Urology News, which adds, "There are also reports of patients surviving ingestions greater than 400 ml." "Permanent visual damage may occur with a minimum ingestion of 30 [ml] of methanol," according to the National Center for Biotechnology Information, part of the National Institutes of Health. Methanol poisoning can be treated in several ways, including administering fomepizole — an antidote to toxic alcohols — or ethanol. Both of those substances outcompete methanol in the liver, keeping it from being metabolized by the enzyme alcohol dehydrogenase, according to the NCBI. Dialysis is also used to remove methanol from the blood system.